Here are a few ideas that may seriously improve your quiz night. Take a look and please feel free to use any of the ideas as you seem fit. CREATE YOUR OWN PUB QUIZ POSTERS. Promotion is key to most events, posters are a great way to let people in the pub know what’s on and when. 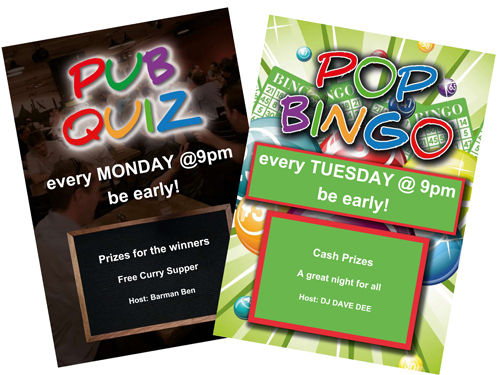 We have recently added a feature so you can create your own posters to promote your Pub Quiz and Pop Bingo nights… and it’s ‘FREE’. The posters are available in A4 or A3. You can add the day/date, the prizes and other info to best get your message over, then simply print. It’s Quick, it’s easy, it’s smart. CLICK HERE and start creating your new posters straight away. A new fun, easy and engaging round for your pub quiz or alternatively a whole new Pop Bingo night. It’s BINGO with singers and bands replacing the numbers. Each player/team is given a bingo-style sheet on which are the names of 20 artists. The DJ/quiz host plays from a list of 50 selected songs, the players simply mark-off the artists as they here them. Play for a line and then a full house. Custom build your Pop Bingo sheets to suit your players, their age groups and their musical ability. Great fun for every one. See below for more info. Ready to create your unique Pop Bingo? Just make your selection and click the ‘Create’ button. Pop Bingo is a fun, easy and an engaging additional round for your pub quiz or alternatively a whole new Pop Bingo night. Each player/team is given a bingo-style sheet with the names of 20 artists on, selected and arranged randomly from a master list of 50, which are listed for the host. Pop Bingo best suits a DJ or quiz host with a good selection of music or has a streaming subscription. Simple create an individual file/crate in your DJ software to list songs from the list of Pop Bingo artists. Arrange the songs into a list and play a short snippet of each song in order. The host can make it as easy or as difficult as they prefer based on which track by that artist they choose to play, which part of that track and for how long. The players/teams have to identify the artist and, if it’s on their Pop Bingo sheet, cross them off. From there, it’s pretty much normal bingo, with the host deciding what prizes are available for what; maybe a lines, and then a full house etc. The Pop Bingo sheets are styles to best suit your crowd. Chose from ‘Older’, ‘Younger’ or ‘Mixed’ age groups or decades to best suit. You can also chose ‘more obscure artists’ if your crowd are more music savvy. 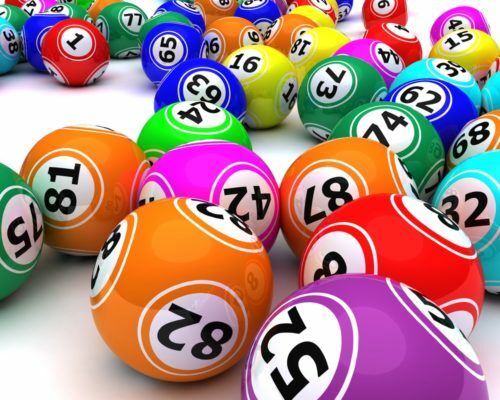 You can also select 25, 50 or 100 bingo sheets (all different) for each game, depending on the size of the crowd, and you can have up to 3 games per individual sheet. Great fun for all and a great opportunity for a brand new night. Here’s an idea I have been using for a while now that’s going down very well. I call it the One Minute Quiz. Part way through my Quiz Night, I invite teams to come and get a sheet for the One Minute Quiz. When all teams are ready I announce this weeks subject i.e. “Parts of the body that are made up of just three letters”, then start the clock. Personally, I play the Benny Hill theme that lasts around a minute. When the minute is up I ask the teams to put their pens down and ask who has more the 10? more than 15? and so on until I find the team with the most answers. Read through the answers and see if the other teams agree. The prize needs to be something simple, like a bag of sweets, a free ticket into the Play Your Cards Right/Open The Box draw etc.. By the way, I have had almost thirty parts of the body that are made up of just three letters! Other subject can be ‘Songs with a colour in the title’, ‘Slang words for bum’, ‘Shades of red’, Songs with a body part in the title’, ‘Things you put on your feet beginning with S’, ‘Sweets sold in jars’, Pizza toppings’, ‘Australian Towns or Cities’, ‘Something with a hole in it’, ‘Scottish football clubs’, etc. etc. The list is endless. As always keep it fun! CAN PUB QUIZZES SURVIVE IN THE SMARTPHONE ERA? Click here for a link to a BBC page looking at how to Google-proof your pub quiz. WE SAY… this problem has been around for a while, nip it in the bud early, but we always include a number of ‘Google-Proof’ questions in each quiz… just in case. 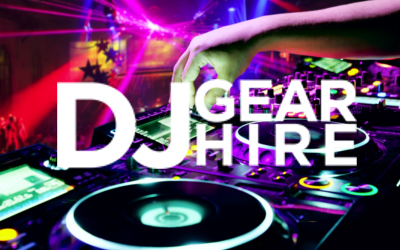 DJ Gear Hire offer full DJ set-ups from just £65 per night. They also hire PA Systems, Radio Mics, Lighting FX, Smoke Machine, etc. Does your pub quiz suffer from “the same winning team every week” syndrome? Here’s an idea that will cut that out. Replace your regular answer sheets with our Bingo Quiz sheets (available on the FREE STUFF page). Players write their answers in any of the circles on the bingo board along with the question number, as well as in the boxes on the left. After all 20 questions have been called, ask them to tear-off the slip on the left and hand it in. Call the answers in random order. The winner is the first team with a line of correct answers ACROSS the bingo board. You can get three or four games in per night. Don’t forget to take breaks; let them get the beers in then hand out more bingo quiz sheets for the next game. This has the added bonus that late comers can join in. Similar to the Bingo Quiz, the Blockbusters Quiz sheet make you quiz more random, So anyone can win. Replace your regular answer sheets with our Blockbusters Quiz sheets (available on the FREE STUFF page). Players write their answers in the boxes on the left, then again on the blockbusters board. After all 20 questions have been called, ask them to tear-off the slip on the left and hand it in. Once again, you can get three or four games in per night. Don’t forget to take breaks, let them get the beers in then hand out more blockbuster quiz sheets for the next game. There are lots of great free apps for the iPhone and Android phones. They can also be used for bingo, raffle, drawing play your cards right and open the box tickets. Pub Quiz nights have been a regular source of mid-week work for many DJs for many years and, if done right, can be quite lucrative. If you are thinking of including a few mid-week nights to your weekly list of gigs, or even if you currently host a pub quiz night. Here’s a couple of tips from my 25 years of hosting pub quizzes. For most of you it might seem I’m covering the basics. But if you can pull one little tip from here, job done. Hope it helps. FIRST OF ALL Don’t lose sight of what a pub quiz night is all about. It’s about keeping the tills ringing, selling beer/food etc. So a well-structured evening with lots of opportunity for teams to visit the bar is what it’s all about. I’m a firm believer in not over-cooking anything. Two/two and a half hours is about the max to keep an audience’s attention. Anymore and you are stretching it. Three rounds, made up of a 20 question picture quiz or Table Top quiz is a great introduction to your night followed by a general knowledge round and finally a music round. That should fill your night out nicely. ADVERTISING Posters in the pub, flyers on the tables. You can get A3 or A2 full colour posters on-line for a few quid, same with the flyers. Backed up with social media – Facebook, Twitter, etc. Plus the A board outside the pub to attract passing trade. If you are starting a new night, ask the manager to get staff, family and friends and the regulars to get teams sorted out in advance of the night. QUIZ QUESTIONS. Don’t waste time writing your own questions and collating pictures /catchphrases, etc. There are companies on the internet where you can instantly download quality pub quiz questions and games for a few quid. Quizsupplies.co.uk is a great place to start. ANSWER SHEETS You can always design your own or there are a number of different answer sheets ready to download for free from the ‘free quizzes page’ on the quizsupplies.co.uk website. KNOW YOUR AUDIENCE Don’t just read your questions straight from the question sheet. Look over the questions first. Make sure you can pronounce any unusual words or names and adapt any questions that may be too tough for your crowd. If Questions are too tough or too easy, your teams will lose interest and you will have another empty table. If you feel the question is too difficult for your crowd, simplify it. Replacing ‘whom’ with ‘which drummer’ or even ‘which Beatle’. Likewise if the question is too easy, make it tougher by leaving some of the information out of the question. Another way is to give multiple choice answers. RULES Be very clear on the rules. Rule 1, the quizmaster is always right. Rule 2, if the quizmaster is ever wrong, Rule 1 applies. Rule 3, It’s a fun quiz so put your phones away. TEAM NAMES Table 6, and The Hamilton’s doesn’t give you much to work with. Ask your team to go for elaborate funny team names and read the out to encourage them. Natural Born Losers, Norfolk And Clue, Quizimodo, Universally Challenged, The shy teds, Nice Place To Put Your Face, Beating Chastards, Agatha Quiztie, have been some of my favourites. SUPPER The Quiz Supper always helps to put bums on seats. Hotpot, chilli or a curry for a £1 if the pub has catering facilities, or free sandwiches if not. PRIZES Don’t have to be massive. £20 bar tab for the winners £10 for second. Make the bar tab valid for the following week’s pub quiz. That way you are a guaranteed the repeat business. Design your own bar-tab/vouchers in the form of full colour business cards from vistaprint. Includes boxes on the back that can be filled-in by hand for valid on date, and signature. The front of the bar-tab/voucher is an open invitation to plug your DJing services. MID WEEK SPORT If the football is on the TV. Don’t cancel the quiz, you potentially have a crowd of new quiz teams. Hand out the Picture Quiz or Tabletop Quiz during the halftime interval and tell teams you are starting straight after the football. Usually they’ll stay and join in.